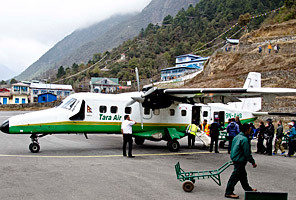 IMG requires that all* trip participants purchase Travel Insurance that includes coverage for medical evacuation, repatriation and medical expenses for the duration of their IMG program. Trip Cancellation Insurance is strongly recommended. Trekking and mountaineering programs are true "adventure travel." As such, each program requires long lead-times  for us as a guide service and for you as a participant  in order to properly plan and prepare. Unexpected life events occur. Your travel plans might change due to illness while you are abroad or because of a family emergency even before you leave home. Our recommendation is that you protect your investment and welfare against these unexpected circumstances so you and your loved ones can prepare for your upcoming adventure with more peace of mind. Policy must be purchased within 21 days of initial trip payment. Please refer to DOC for full details and limitations. Base plan benefits include medical evacuation/repatriation coverage of up to $1,000,000. By using IMG's account ID #148218, trip cancellation includes coverage of up to $100,000 and trip interruption of up to $150,000. Any chance of needing to cancel for another reason not covered by your base policy? This upgrade is for you. To receive this upgrade benefit, your policy and upgrade must be purchased within 21 days of initial trip payment. You must insure the full cost of all nonrefundable prepaid trip expenses. Please refer to DOC for full details. Medical evacuation/repatriation coverage of up to $1,000,000. Haven't purchased your airfare yet? No problem. Purchase your plan within 21 days of your initial trip payment. Then once you have your airfare, give Travel Guard a call to add more coverage for the cost of your airfare. Not sure you purchased the right plan? Don't worry. You have a 15-day review period to look things over. If you are not fully satisfied, you may cancel your policy and Travel Guard will refund your premium paid. Please be sure to review the plan details for more information. This web page is a partial description of benefits. Per Travel Guard, your individual policy will govern the final interpretation of any provision or claim.